The Beer Planet is the best and most complete specialty beer store on the market! Beer Planet offers a unique shopping experience through a complete portfolio of products selected by a beer sommelier and a club of exclusive benefits and benefits, as well as being the only beer club for subscription with plans for intermediate and advanced beginners. 29/03/2019, 16:50 New promotion in The Beer Planet - Cervejas Especiais! 26/03/2019, 16:48 New deals in The Beer Planet - Cervejas Especiais! 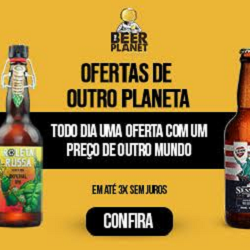 22/03/2019, 16:35 New deals in The Beer Planet - Cervejas Especiais! Abridor Mini Engradado Preto The Beer Planet. 21/03/2019, 16:33 New promotion and banners in The Beer Planet - Cervejas especiais! Todos os dias ofertas de outro planeta - em até 6x sem juros. 13/03/2019, 21:35 New promotion in The Beer Planet - Cervejas Especiais! Kit Degustação do Consumidor de Cerveja - 8 unids De R$ 201,95 porR$ 129,99 > 35% OFF. 12/03/2019, 22:09 Consumer Week - New deals on The Beer Planet - Cervejas Especiais! Cerveja Schmitt La Brunette 350ml - De R$17,99 por R$10,79. 11/03/2019, 22:00 Consumer Week - New promotion in The Beer Planet! Semana do Consumidor - Cervejas artesanais com até 50% OFF. 01/03/2019, 17:12 New deals in The Beer Planet - Cervejas Especiais! Kit 6 Pilsner Urquell + Caneca Oficial 500ml. 18/02/2019, 22:40 New deals in The Beer Planet - Cervejas Especiais! Cerveja Imigração Hop Lager Lata 350ml. 13/02/2019, 21:47 New promotion and banners in The Beer Planet - Cervejas especiais! 12/02/2019, 19:48 New coupon at The Beer Planet - Cervejas Especiais! 08/02/2019, 17:02 New promotion in The Beer Planet - Cervejas Especiais! Kit Degustação 3 Maniacs Rebellion + Pint Grátis com 50% OFF. 05/02/2019, 16:08 New promotion and banners in The Beer Planet! New promotion and banners in The Beer Planet! THE BEST CUP COLLECTIONS OF THE BEST BEERS! 29/01/2019, 15:46 New offers at The Beer Planet! Cerveja Barco Brazilian IPA 3 Limões Lata 473ml. 18/01/2019, 16:31 New offers inThe Beer Planet - Cervejas Especiais! Cerveja Mea Culpa Vaidade Lata 473ml! Pack 6 Paulistania Lager 350ml Lata! Cerveja Dádiva Carmel Beach IPA + Copo! Kit 4 Weihenstephaner + Copo Chuteira! Kit Degustação Ampolis do Mussum - 6 unidades! Pack 12 Cervejas Ampolis Cacildis do Mussum 355ml! Pack 8 Cervejas Erdinger Weissbier Lata 500ml! Pack 8 Erdinger Weissbier 500ml! Pack 12 Blue Moon Belgian White 330ml! Pack 12 Schornstein IPA 500ml! 03/01/2019, 16:44 New banners in The Beer Planet! 27/12/2018, 17:24 New deals in The Beer Planet! 11/12/2018, 21:03 New promos in The Beer Planet! New promos in The Beer Planet! 30/11/2018, 20:50 New coupons on The Beer Planet! 26/11/2018, 22:35 Cyber Monday - New deals in The Beer Planet! 19/11/2018, 20:02 Black Friday - New promotion and banners in The Beer Planet! 08/11/2018, 20:51 New promos and banners in The Beer Planet! New promos and banners in The Beer Planet! 07/11/2018, 21:13 Black Friday - New promotion in The Beer Planet! 01/11/2018, 22:24 New deals in The Beer Planet! 17/10/2018, 21:55 New promos in The Beer Planet! 08/10/2018, 18:17 New coupon at The Beer Planet! 5% OFF on the whole site! 26/09/2018, 21:04 New promos in The Beer Planet! 11/09/2018, 19:53 New promos in The Beer Planet! 11/09/2018, 00:14 New banners in The Beer Planet! New banners in The Beer Planet! 03/09/2018, 23:20 New promotion in The Beer Planet! 31/08/2018, 21:53 New banner in The Beer Planet! 30/08/2018, 18:34 New deals in The Beer Planet! 24/08/2018, 23:27 New promos in The Beer Planet! 21/08/2018, 19:26 New promos in The Beer Planet! 20/08/2018, 21:38 New promos in The Beer Planet! 13/08/2018, 18:15 New deals in The Beer Planet! 10/08/2018, 18:21 New promotion in The Beer Planet! 06/08/2018, 18:13 New deals in The Beer Planet! 25/07/2018, 23:19 New promotion in The Beer Planet! 24/07/2018, 20:48 New deals in The Beer Planet! 20/07/2018, 22:06 New promotion in The Beer Planet! 18/07/2018, 23:57 New promos in The Beer Planet! 16/07/2018, 21:50 New banners in The Beer Planet! 13/07/2018, 23:01 New offers at The Beer Planet! 11/07/2018, 21:25 New promotion in The Beer Planet! 05/07/2018, 21:12 New promos in The Beer Planet! 03/07/2018, 21:26 New promotion in The Beer Planet! 03/07/2018, 17:23 New coupon and banners in The Beer Planet! New coupon - 10% OFF. * Valid for first purchase. 29/06/2018, 22:14 New promotion in The Beer Planet! Take 4 pay 3 From $ 79.96 to $ 59.97. 27/06/2018, 16:19 New deals in The Beer Planet! 19/06/2018, 19:20 New promos in The Beer Planet! 08/06/2018, 21:15 New promos in The Beer Planet! 04/06/2018, 19:53 New promos in The Beer Planet! 29/05/2018, 22:15 New promos in The Beer Planet! 25/05/2018, 21:40 New promotion in The Beer Planet! Pac of 4 cans of beer stands for $ 39.99 for: $ 39.99 !! (I.e. 24/05/2018, 00:08 New promos in The Beer Planet! 21/05/2018, 20:42 New piece of email marketing in The Beer Planet! 17/05/2018, 00:02 New deals in The beer Planet! 10/05/2018, 20:46 New promotion in The Beer Planet! Tupiniquim Beers up to 37% OFF. 10/05/2018, 17:50 New deals in The beer Planet! 25/04/2018, 17:14 New promotion in The Beer Planet! 19/04/2018, 21:42 New promos in The Beer Planet! 13/04/2018, 21:32 New promotion in The Beer Planet! 12/04/2018, 22:11 New promos and banners in The Beer Planet! 10/04/2018, 20:50 New promotion and banners in The beer Planet! 04/04/2018, 18:22 New deals in The beer Planet! 03/04/2018, 21:35 New coupon and banners in Beer Planet! New coupon and banners in Beer Planet! 29/03/2018, 17:44 New promotion and banners in The beer Planet! 28/03/2018, 18:28 New promotions and banners in The Beer Planet! 23/03/2018, 20:54 New promotion and banners in The beer Planet! 19/03/2018, 18:33 New promotion and banners in The beer Planet!